Ever have one of those days when all you want to do is shut out the world and hide away in your coziest sweater? Well, thanks to Pinterest engineer Ruth Grace Wong and her incredible invention — the “leave me alone” sweater — you can now make that dream come true. Wong first developed the sweater back in January after getting chilly at work. 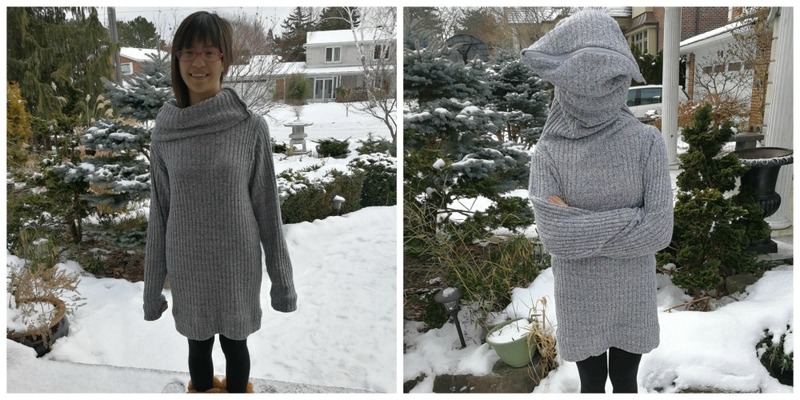 A colleague showed her the “laptop compubody sock,” a sweater/sock hybrid creation that covers the head but still allows for comfortable typing on a laptop, which inspired Wong to develop her own take on the privacy sweater. And thus, the “leave me alone” sweater was born! Wong posted DIY instructions for how to replicate the sweater on Instructables, and launched a vote-getting campaign on fashion-oriented crowd-funding site Betabrand. Her campaign was successful, and the “leave me alone sweater” will soon be available for purchase from Betabrand. "Since finishing college I've been striving to learn to do things at scale, be it software or production of goods, because I want to make a difference," wrote Wong in a Facebook post in January. She added, "At Pinterest we have a supportive community of makers. During the day we work on a product that helps inspire people to apply ideas to real life. In our spare time, we share DIY projects and inspire each other." Consider us inspired! We definitely looked into DIY-ing our own “leave me alone” sweaters, and now we’re super excited to support Wong and her creative endeavors by purchasing this incredibly useful (and, let’s be honest, necessary) clothing item.